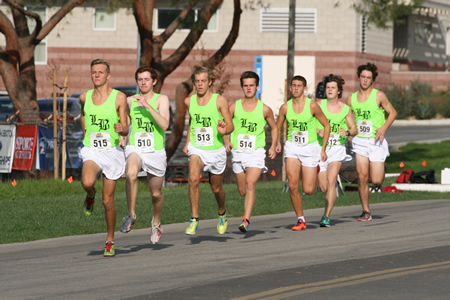 LBHS cross-country runners, from left, Cameron Zuziak, Grant Barton, Penn Nielsen, Mason Pitz, Drake Butler, Liam Corrigan and Carter Fraser compete in the CIF finals at Mt. San Antonio College last Saturday, Nov. 22. Photo by Tricia Harper. 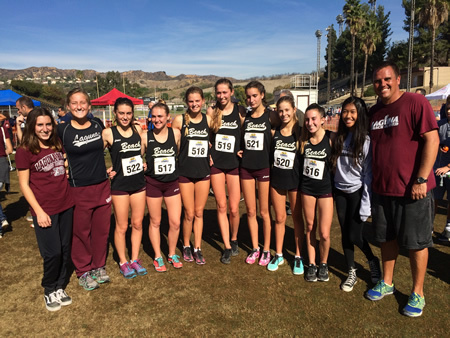 From left, Lauryn Alvarez, Annie Brown, Brenna Merchant, Pearl Shoemaker, Janie Crawford, Natalie Kimball, Kirsten Landsiedel, Grace La Montagne, Taylor Alvarez, Allison Konno with coach Steve Lalim. Most of the girls who ran in the CIF finals at Mt. SAC will go on to the state championship race, set for Saturday, Nov. 29 in Fresno. Photo by Terri Kimball.